Projects created in the MPC 2.5 software will not be compatible with earlier versions of the software. Owners of an MPC Live or MPC X will also need to perform the MPC 2.5 firmware update for compatibility with new features like the software instruments and arpeggiator. See our guide here for instructions on updating your MPC X or MPC Live. The MPC 2.5 firmware update for MPC Live and MPC X can be installed directly from a USB drive without connecting the MPC to a computer (current firmware must be 2.1 or later). Visit our guide here for a complete walkthrough. For a comprehensive list of new features and improvements, please see the complete release notes here. 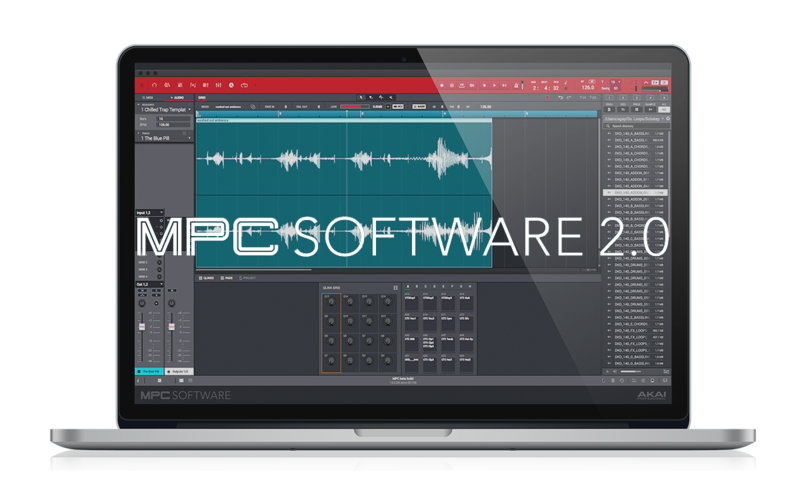 If you already have the MPC 2.0 software installed, the easiest way to download is to open the software. As long as your computer is connected to the internet, you will receive a notification about the 2.5 update and the option to download. If you do not already have the MPC 2.0 software installed, or your computer is not connected to the internet*, use your Akai Pro account to download the latest MPC 2.3 software package. Create and/or log in to your Akai Pro account. If you have not already registered your MPC, select Register My Product and register your MPC X, Live, or Touch. Be sure to include the "(21)" with the parentheses when entering the serial number. On your account page, click on the Included Software drop-down menu below your registered MPC. Click on the Mac or PC version of the installer package to begin the download. **If you purchased the software with an MPC Renaissance/Studio or received an update with your MPC Studio Black, you can download the latest update by visiting your Fastspring account using the email used at purchase. Click here to access your account. Once the software package is downloaded, find and run the installer. This should be in your downloads folder. For Windows users, be sure to unzip the folder first and run the Install MPC file to run the installer. Click Update MPC Software. Keep in mind, this will replace the older version of MPC on your computer, but this will not replace or delete any of your projects, programs, tracks or samples. Follow the installer instructions. Be sure to choose which plugin components of MPC to install and where when prompted (Windows only). You'll need to know this location to use MPC as a plugin in your DAW. If you're unsure, we recommend installing every component to its default location. Once the installation is finished, you're ready to use MPC! Whether you are a customer or dealer, if you already own an Akai product, or if you just have pre-sales questions, the experienced Akai technical support team is available to help! Visit the link below to connect with any of the following support options: online community support, phone support, email support.